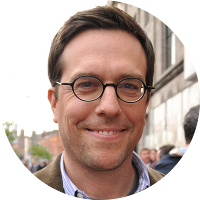 Ed Helms is an American television and movie actor who is probably best known for his roles in The Office television series and The Hangover movie franchise. He began his career as a comedian in New York when he got his big television break with The Daily Show. Ed Helms has a number of fellow celebrities as kin. These include, but are not limited to, Bill Paxton, Sara Paxton, Elvis Presley, Humphrey Bogart, Lucille Ball, Richard Gere, Anthony Perkins, Christopher Reeve, Oliver Platt, Jodie Foster, Liv Tyler, Ben Affleck, and probably Marilyn Monroe. His family tree also includes a number of former U.S. Presidents including Jimmy Carter, Grover Cleveland, Millard Fillmore, John Quincy Adams, Rutherford B. Hayes, Gerald Ford, and George W. Bush. He also has family connections to a number of U.S. First Ladies including Abigail Adams, Edith Roosevelt, Ellen Wilson, Florence Harding, Nancy Reagan, Bess Truman, and Barbara Bush. Ed Helms has his fair share of famous historical figures in his family tree. These include Confederate General Elisha Paxton, Union General William Tecumseh Sherman, abolitionist John Brown, Republic of Texas President Sam Houston, American painter John Trumbull, Girl Scouts founder Juliette Gordon Low, Circus pioneer P.T. Barnum, and U.S. Vice President Aaron Burr who killed Alexander Hamilton in a duel. He also has kinship to a few of the signers of the Declaration of Independence including Oliver Wolcott, William Williams, and Samuel Huntington.